The other day at work, I had an elderly patient with a terrible chronic cough, the frequency and audible intensity of which was exponentially worsened after having an endoscope put down his throat for an entirely unrelated set of symptoms. When I inquired about this cough during his pre-op assessment, he replied, "It's normal for me." In other words, that unrelenting cough was his baseline, the end result of 50 years of heavy cigarette smoking, even though he'd quit tobacco over twenty years ago. A puff of this'll do ya! "Did you use your inhalers this morning?" I asked hopefully. He nodded affirmatively, and I was glad to hear that he'd brought both of them along with him. "Take a couple of extra puffs of this one," I said, handing him a red albuterol* inhaler. "We're gonna stir things up, looking down your throat with our camera, and you're probably going to cough a lot while you're waking up. This'll help calm your airway down." The anesthetic for his three minute EGD** was uneventful, and he tolerated the procedure well. However, as I'd predicted, his post-endoscopy course was complicated by coughing that came in paroxysmal volleys, bombarding the recovery room's airspace with decibel-shattering blasts, drowning out ambient conversation, beeping monitors, and even the telephone. His nurse shook her head. "How can she live with that?" she wondered aloud, observing as his wife sat quietly at his bedside, seemingly indifferent to the hacking clamor. "I don't know," I responded, lying through my teeth. Rory using his vibrating lung-cleaning vest (2003). An incomplete sampling of routine CF medications. it were us suffering instead of our children, wondering what "normal" feels like while trying to recall worry-free yesterdays before the cough. What was once inconceivable quickly becomes ordinary. It almost seems odd to us that other peoples' kids don't have to swallow 3-9 pancreatic enzyme capsules before every snack and meal or have their chests beat on three or four times a day to help clean out their infected lungs. Yes, coughing certainly can precipitate crazy. The first symptom of schizophrenia experienced by a friend of my sons' father was a cough. George had enlisted in the Navy after high school, and at some point during his early twenties was stationed on a submarine, training to become a SEAL. 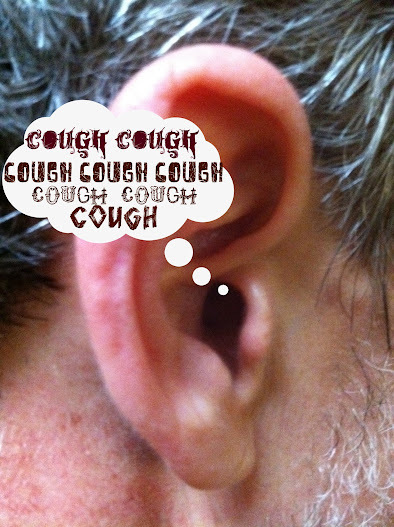 Out of nowhere, he started hearing a cough. It was random at first, a low-pitched cough that sounded like someone trying to clear his throat. No one else could hear it. That auditory hallucination, a simple cough, heralded his descent into madness. I remember all too well a comment I overheard as a medical student, made by a somewhat callous and inept pediatric surgeon who described the lungs of patients with cystic fibrosis as "bags of pus." To his credit, he didn't know I had identical twin boys with CF. I've never quite gotten over the mental imagery his comment evoked. Nick and Rory were about nine years old at that time, and health-wise, they were doing quite well. For people with CF, health is measured by how much they're coughing; it's an inversely proportional relationship. Even though the boys weren't coughing a lot back then, it crushed me to hear a physician speak so disparagingly about their disease, even though I knew their condition would progressively deteriorate with each passing year. Not all coughs are pathological causes for concern. Just as new parents learn to distinguish an infant's cries of pain from those of hunger, boredom, or discomfort, I can hear a cough and discern whether it's worrisome or benign, based on intuition and an experiential qualitative comparison of wavelengths. Similar to Liam Neeson's character in "Taken," I too have developed "a very particular set of skills...acquired over a very long career." I've also learned that Fate is impartial, not unfair. I don't believe in a God who doesn't give us more than we can handle, but I do have faith in the way things are. In that faith lies the balance between hope and fear, the stoutheartedness which drives me to support and encourage my sons no matter what, to continue playing my hand instead of folding, to roll with the punches, to keep on keepin' on even when the going gets rough. I accept flux, not the status quo. Problems only seem insurmountable to those who are inflexible, and baselines are neither rigid nor absolute. Like the concept of normal, they're really just a reference point. Liam Neeson's epic "very particular set of skills" scene from "Taken." *albuterol: a bronchodilating inhaled medication which promotes opening of small air passages in the lungs. **EGD: esophagogastroduodenoscopy. A procedure which uses a small tubular camera to examine the esophagus, stomach, and first part of the small intestine. Thanks for stopping by, Big D! I know next to nothing about CF but I saw a program about children who had this, and when I saw the amount of work the parents had to do in order to clear their lungs each day or several times a day I know that I wouldn't be able to cope. So I have nothing but respect thinking about what you have gone through with both your twins. I mean, look at the amount of medications they have to take constantly? Taking the right ones at the right times and even making sure that the medication is suitable for them. I say suitable, because when I had severe asthma some of the prescribed medications actually made me worse but the doctors dismissed what I said, and I had a fight on my hands for a long time to get the right meds for me. Helena, life has a way of panning things out. You have the perfect package to care for your sons. A mothers love from the heart plus professional competency and training from the head. The short clip from 'Taken' said it all. 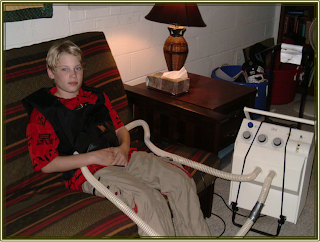 RPD, caring for kids with CF definitely requires a tremendous amount of work and commitment. Once the kids themselves are old enough, they have to assume responsibility for their own health, a task which is especially challenging during adolescence. But, as we've discovered, it's do-able. The boys lead happy lives, and we've never made their disease the center of our existence. It's just a part of our lives. Haha, they've never considered modeling, but I agree, they are good looking fellows! Helena, this is such an incredible post. You have so much wisdom to share and it is a pleasure to read your words. "I've also learned that Fate is impartial, not unfair. I don't believe in a God who doesn't give us more than we can handle, but I do have faith in the way things are." Beautiful. I'm glad your boys are doing well. All I know is they have a very supportive, caring mom. Thanks for your uplifting and inspiring writing. I'm often amazed @ the chronic life situations that many learn to somehow tolerate. These people are something very special. I know...I'm not telling you a thing! I appreciate that, Ian. I think many of us tend to underestimate our ability in handling challenging situations. These "special people" have certainly brought out the flexibility in me! "I've also learned that Fate is impartial..."
From a casual cavorting on cough you led us to abounding fate and callousness and in the midst of it all, your full-hearted rallying around your sons. It is a both tangy and humbling post. Thanks, Uma. In many ways, my sons' illness has been a gift of compassionate awareness that's given all of us an incredibly deep regard for living life to its fullest. Another great post, Kris. Full of courage and spirit and insight. When I read something of yours I know I'm not just going to hear a lot of empty abstractions, hollow ideas, but the true and raw material of experience. You don't evade the harsh realities, but show us how to confront and endure them. It's a fascinating thing to me that having a true fighting spirit depends first of all on accepting life as it presents itself to us, life as it is. NP, it's intriguingly paradoxical how fighting the good fight requires acceptance of the way things are. It's one of the great mysteries of life. That is a twisted word, "Normal", because each person has his/her own definition. I would like to believe that using this word could be non judgmental, however it is rathe used as someone else's baseline. I think in the end, each of us are our own version of normal. I have been asked more than once by my son if he will ever have a "normal" life since he is an Autistic Bi-polar boy. People tend to not want to understand others and their way of life, sad when you look at it. Steven, I agree...normal is defined by each individual, but it can't be readily extrapolated to other individuals. It is twisted! What do you tell your son when he asks if he will ever have a normal life? I didn't know much about CF until this post, but I do know a thing or two about courage and resilience. Your boys are blessed to have a mom with a fighting spirit. Looking at their picture, I feel like they were lucky to inherit some of it too. Thank you for another beautiful post. And for helping understand more about what's "normal" in the world. Gina, you're not alone...a lot of folks, even in healthcare, don't know much about CF because it's fairly rare, and often mistaken for cerebral palsy. I'm glad you enjoyed the post. From the boys' pictures, you'd never be able to tell there was anything wrong with their health; they look completely "normal." I think that's such an interesting phenomenon, how things can seem normal when viewed in two dimensions. That fighting spirit is what keeps us all going. Melody, thanks for your kind words about the boys...I am definitely a proud mama. They are two of the most genuinely compassionate, warm-hearted people I know, and they have a wonderful set of supportive friends to boot. I agree, our ability to adapt is truly amazing, and it's a simple as listening to our bodies. My son for some reason gets Bronchitis a few months of the year, it is not Cystic Fibrosis I know, but the sound of him coughing in the night upsets me to no end, it brings me great worry and causes me many sleepless nights, your question about what is normal is an interesting one, I wonder if his cough did not go away if I would just get used to it. PBS, coughs can be absolutely maddening, similar to how the nurse in my post reacted (but usually not to the extreme of madness!) It is something you get used to, but it's still upsetting, even if it's just a benign cough. It's funny because in the operating room, there are bells and buzzers constantly going off. That tends to scare people who've never been in that environment. I've gotten to where I pretty much ignore most of that noise because I'm so tuned into it...when a "real" alarm occurs, I know it instantly, without even glancing at the monitor. Has your son's bronchitis been evaluated? 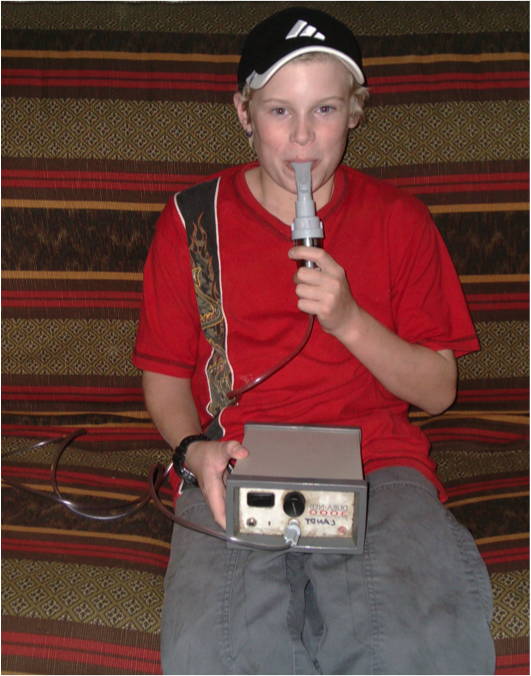 Sometimes, kids grow out of things like asthma...maybe it's the same sort of situation with your son, especially if he's otherwise healthy. Wonderful post Kris! I too agree that God doesn't give us more than we can handle. At least this has been true in my experience. You dance the delicate dance of Mom and Doctor very well. Your sons are very handsome, and I love the last picture of them looking and feeling well! Thanks, Michelle! I love that last picture of them, too. They are both working very hard at improving, as well as maintaining their health. Hopefully 2013 will be a year without hospitalizations or home IV antibiotic therapy. Fingers crossed! Kris, you are an amazing mother with two amazing sons. I can’t even begin to comprehend what all of you go through every day. Yet, you, Rory and Nick go through it all with such strength, such purpose in life to move forward, refusing to see anything as an obstacle. I have so much admiration for that kind of courage. I know people who fold in life for much less. Yes, you have developed a “very particular set of skills,” and those skills are enhanced by the strong will of a mother’s love. I found your last paragraph very moving, and so true. It’s truly inspiring the way that Rory and Nick are so engaged in life and in their music. I love those photos of them. Despite everything, they look so positive and happy, handsome too. From what I’ve heard of their band on music videos, they are very talented; they rock! My father had emphysema and bronchial asthma. I heard his loud, hacking coughs and how he’d gasp for breath reaching for his inhaler, so I have some idea of what that sounds like. I had little knowledge of CF except for hearing about it casually, so thank you for helping us understand more about it. Btw, that pediatric surgeon was an insensitive cad! Your sons are lucky to have you. I know I've said that before but I can't say it enough. Not just for the care you've given them but for the attitude you've given them, too. Just because life isn't easy doesn't mean it can't be fun, and I LOVE that clip from Taken. One of my favorite movies! !